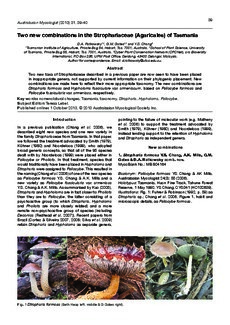 Copyright 2013 Australasian Mycological Society Inc.
Two new taxa of Strophariaceae described in a previous paper are now seen to have been placed in inappropriate genera, not supported by current information on their phylogenic placement. New combinations are made here to reflect their more appropriate taxonomy. The new combinations are Stropharia formosa and Hypholoma fasciculare var. armeniacum, based on Psilocybe formosa and Psilocybe fascicularis var. armeniaca, respectively.